Red Bricks are mostly recognized materials for building all through the world since they are inexpensive, long-lasting as well as simple to deal and work with. The other vital features of red bricks range from superior stability and strength, low weight and greater ecological green features. 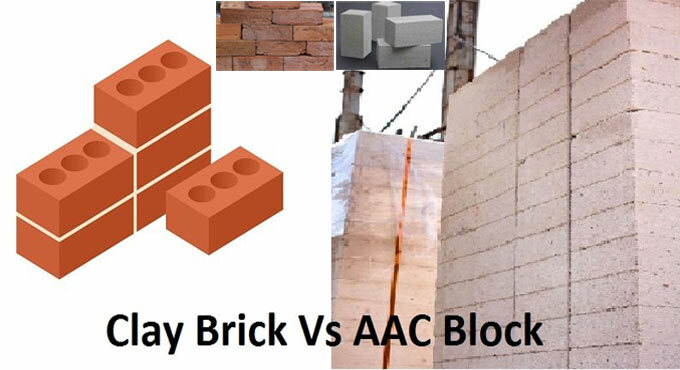 AAC Blocks and Red Bricks both are essential building materials for constructing walls. Red bricks & AAC blocks are utilized in walls according to their properties, accessibility and cost. Given below, the basic differences among red bricks and AAC blocks. • A Red brick stands for a block, or a single unit of a ceramic material that is applied in masonry construction, normally amassed collectively or placed with different types of mortar to retain the bricks jointly and develop a permanent structure. • Bricks are generally formed in common or standard sizes in mass quantities. • The weight of AAC Blocks is light and they are cut into masonry blocks or developed larger planks and panels. • AAC Block is comparatively homogeneous with reference to other wall unit and does not include coarse aggregate phase. • The red bricks are produced by amalgamating clay(alumina), sand, Lime, iron oxide and Magnesia. • Natural soil is utilized for making Bricks. So, it is totally based on the quality of local soil, i.e. Top soil of Earth Crust. • It is produced from the mixture of fly ash, cement, lime, gypsum and an aeration agent. • The Fly ash employed in AAC Blocks production is environment friendly & cement is applied in very small amount. • The difficulty of fly ash usage is resolved with the use of fly-ash in AAC Block. • AAC Block is applied to develop internal and external walls. • It can also be applied as load bearing and non load bearing walls.